The Singaporean co-founder of online boutique Cocotakumi.com is married to Dane Jesper Hansen, 46, a regional manager for a technology company. Favourite destination: Ho Chi Minh City, Vietnam. Its generous people, entrepreneurial culture, rich history and excellent food and coffee make it one of my favourite cities to revisit. The Vietnamese are resilient and proud of their culture, heritage and craftsmanship. A lot is happening in the city at the moment and everyone is doing whatever he can to have a better future for himself and his family. The people's enduring optimism is one of many reasons I love the vibe there. 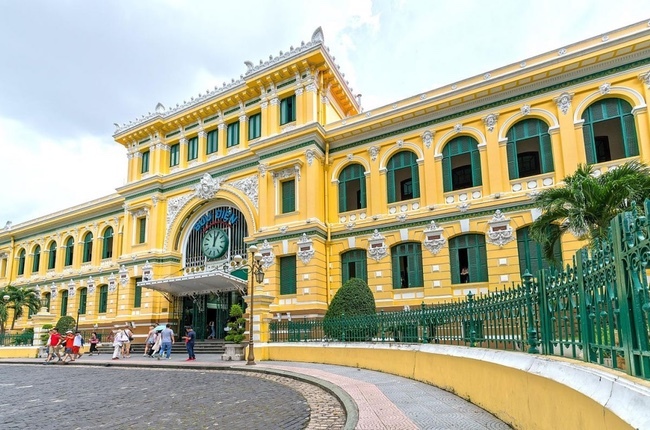 The Saigon Central Post Office is one of the most symbolic architectural structures in Ho Chi Minh City. It was built between 1886 and 1891 with Gothic, Renaissance and French influences. It is beautifully preserved and a reminder of how important the post office was in the days before mobile phones and e-mail. I love how the post office blends Western architectural styles with Asian decorations and fittings. In my opinion, it is the grandest post office in South-east Asia and the fact that it is still functioning means visitors get to experience a piece of living history. Right next to the building is a quaint book street called Nguyen Van Binh where I love to go for a weekend afternoon stroll. You can find a variety of book-related stores, old newspaper and magazines exhibitions, greeting card displays, rare books and flea markets for old books. This place is often crowded with people absorbed in their books. On the weekends, local families spend their time here. It's a great way to meet the locals. For the best views of the city, head to Shri rooftop restaurant and lounge (www.shri.vn) or the Social Club Rooftop Bar at MGallery Hotel Des Arts Saigon (www.hoteldesartssaigon.com/restaurants-bars). I would start the day with a lovely breakfast at one of my favourite restaurants, Au Parc (www.auparc saigon.com), a Mediterranean-Middle Eastern restaurant. It is located halfway between the Reunification Palace and Notre-Dame Cathedral in a charming colonial building in District 1. One can still see the original cement tiles, bare brick walls and old window frames. With lofty ceilings and lots of light, it has a peaceful and relaxed atmosphere and good food, which keeps me going back. I like to order the Turkish Breakfast set (about S$12), which comes with feta cheese, olives, fresh tomatoes, hummus, fresh fruit and Turkish tea. My local business partners introduced me to Quan Bui (quan-bui.com) in Ben Nghe, the Japanese Quarter. To me, it serves the best authentic Vietnamese food in Ho Chi Minh City. You must try the Tonkin jasmine flower salad with soft shell crab (259,000 dong or S$15); stir-fried pumpkin flowers and garlic (79,000 dong); and the passionfruit tofu (about 79,000 dong). It focuses on healthy and fresh food and does not use MSG. Its fried housemade tofu is one of its specialities. You cannot leave Ho Chi Minh City without trying a bowl of pho, a classic Vietnamese noodle soup often made with beef or chicken that is served all around the city. My favourite is Pho Hoa Pasteur in Pasteur Street in District 1. The same family has run the restaurant for generations using its secret recipe, and you will taste the difference even if you have eaten pho all day long at other places. The pho costs about 70,000 dong for a standard bowl and 80,000 dong for a big bowl. The vegetarian bowl (30,000 dong) is my favourite. One of the things I like about Ho Chi Minh City is its coffee and cafe culture. I'm a coffee lover and the city is dotted with vibrant cafes such as L'Usine (lusinespace.com). It has three outlets in the city, but my favourite is the one at 151/5 Dong Khoi. I like that it feels hidden even though you are in the heart of the city. There is a cafe, retail space and gallery with a lofty ceiling and industrial design. For me, it is a perfect combination of fashion, art and great coffee and a quiet place to reflect, get inspired, people-watch, read or work. Try to catch a show at the Municipal Theatre, also known as The Saigon Opera House (www.hbso. org.vn). A classic example of French colonial architecture, the Opera House is a certified National Relic and one of Ho Chi Minh City's main attractions. For my birthday in December 2016, I was treated to a show there called My Village, a contemporary circus performance by local theatre company Lune Production (www. luneproduction.com/my-village) and it was one of the most memorable gifts I have received. If I have time, I usually make my way to the quieter and more relaxing District 2 for a short escape from the bustle of the city. Here, one will find many cafes, restaurants, boutiques and spas. I usually opt for the Ayurvedic treatments at Aveda Spa and Wellness (www.avedaherbal.com) as I am a fan of its herbal and traditional therapies. The spa is in a spacious and private bungalow in a lovely residential area. Advance bookings are highly recommended. Afterwards, I will often have a nice leisurely lunch at Saint Honore Saigon (www.facebook.com/ sainthonoresg), a patisserie, boulangerie (bakery) and restaurant which, in my opinion, is the best place in Ho Chi Minh City for pastries and bread. Many people may not know that Vietnam produces one of the world's best chocolates. The award-winning Marou chocolate is made in a factory just outside Ho Chi Minh City, with beans that are hand-picked on Tan Phu Dong island in the Mekong Delta. The brand's shop and cafe, Maison Marou (www.maisonmarou. com), are in a two-storey Art Deco building. I fell in love with the chocolate after one bite - it is a bit fruity with a hint of spice, not too sweet and has a velvety feel as it melts in your mouth. Marou's striking packaging is a piece of art on its own - the vibrantly coloured wrapper is made using traditional silk-screen printing techniques. I always buy a few bars for my family and friends. Prices start at about 55,000 dong for a 24g bar and about 110,000 dong for the 80g bar. For a unique shopping experience, head to 42 Nguyen Hue Street, an old apartment block which has been converted into a buzzing maze of hip cafes, fashion boutiques and co-working spaces. Clothing brand Metiseko (meti seko.com) has a shop near the Opera House, right downstairs from L'Usine cafe. It stocks a collection of high-quality, 100 per cent silk and organic cotton fashion and lifestyle products - all made using socially and environmentally responsible principles and designed and manufactured in Metiseko's atelier in Hoi An. For homeware and decor, I go to Amai (www.amaisaigon.vn). I love its ceramics, which come in watercolour-inspired glazes. For fine crafts, I keep going back to Authentique Home (authentique home.com) in District 1. It offers a vast selection of fine ceramics and textile products such as small purses and table runners. I preferto book a private apartment, guest house or villa so that I get a feel of the local vibe. If I have to choose a hotel, I tend to look for a smaller or boutique one such as the Hotel Des Arts Saigon, MGallery Collection (bit.ly/ 1i88suN) because it exudes romance and the charm of old Indochina. The rooms, all custom-designed by Vietnamese artisans, are beautifully furnished and boast incredible floor-to-ceiling windows. The restaurant and rooftop terrace have breathtaking views of the city.